KCR Software, this program is a fully integrated analysis package which allows the user to build a printed circuit board visually on the screen or load a previously designed board from compatible software data files. 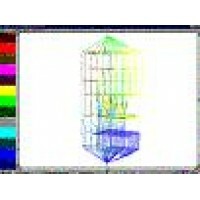 The components are drawn on the screen giving the user a visual interpretation of the computer model created. "PCB" supports advanced features that facilitate model building. The board material and components are selected from the program libraries and as each component is added, the PC Board takes shape on the computer screen. A list of thousands of components are available from the program's library. The included library contains thermal data for each component used in the "PCB" model and may be edited or added to by the user. To solve for temperatures, the printed circuit board model is divided into a grid by the user. Individual grid points may be deleted to create cutouts or odd shaped boards. The user may also add an optional second layer to simulate local or full sized heat sinks. Localized EMI shields may be placed over parts of the board restricting air flow and causing local hot spots. Modes of heat transfer include conduction, forced convection, free convection, and radiation. Transient and phase change as well as steady-state conditions are no problem for the analysis portion of PCB. When resultant board temperatures are calculated, PCB displays them on the computer screen through the use of a color contour mapping. Hot spots as well as cold spots are highlighted on the contour map by distinct color ranges. The color contour map may be rotated in space for viewing at any specified angle or the user may zoom in for more details. The Structural Model created is an overview of the PCB assembly. Nodes, Elements and boundary conditions are create for the PCB and it's various parts. The intent here is to provide a general overlook for the structural integrity of the PCB assembly. For detail analysis a great deal of submodeling is required. After all, very seldom does a pcb actually break, instead the solder or the leads of a component fatigue, crack, or pull loose from the PCB. PCB uses Gaussian elimination during the solution process. This matrix reduction technique provides an exact solution unlike the more common approximation techniques used by many other finite routines. The analysis portion of "PCB" is capable of supporting phase change materials as well as variable heat generation. There are no RC minimums or solution instabilities to be concerned with in the analysis of the printed circuit board.